I've been browsing YouTube book trailers recently & I thought it would be fun to start highlighting some of the books that I really want to read but haven't quite got around to yet. Some of these have been on my to read pile for months (or even years!) but these trailers make me want to read them ASAP. 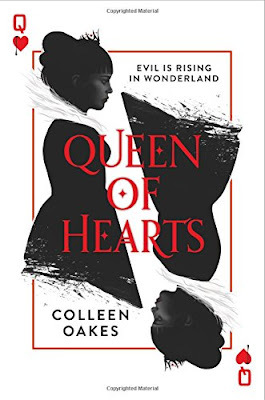 Its fair to say I'm a little bit obsessed with Alice in Wonderland, I read the original books over and over again as a child and now I love to discover retellings or new twists on the story so Colleen Oakes' Queen of Hearts series sounds right up my street. I've had the first two books for at least a year now so I really should read them asap. Dorothy Must Die meets Alice in Wonderland! Dinah is a princess, the future Queen of Hearts, who will one day reign over Wonderland. Unaware of the dark depths of her kingdom; she longs only for her father’s approval and to reign with the boy she loves. But when a betrayal breaks her heart and threatens her throne, Dinah is launched into the dangers of Wonderland. She must stay one step ahead of her enemies or she’ll lose not just the crown, it will be off with her head! Evil is brewing in Wonderland, and maybe, most frighteningly, in Dinah herself. The first in an epic, imaginative series tells the origin of one of the most infamous villains – the Queen of Hearts.